Where is the schedule of events? A full conference schedule will be posted a few weeks before the conference. A basic overview of conference events can be found at the bottom of the Program page. Registration is easy! Just click on the Register link that you’ll find on the top of every page. Follow the steps to submit your information and payment. How does the Computer Room work? Should I bring my own computer? The computer room will be open throughout the conference for Minecraft, World of Warcraft and general internet gaming access. We can’t provide the computers, but tables and chairs and free Wi-Fi will be provided. Bring your own laptop, iPad or PC and join the fun! Can my teen attend without me? While LIFE is Good is primarily a family event, as unschoolers we definitely encourage and celebrate independence! Unschooling teens under age 18 who wish to attend without a parent or guardian may do so as long as you understand that they will be responsible for food and lodging during the weekend and believe that they are mature enough to handle themselves under these circumstances. A parent or legal guardian must complete a 2019 Independent Youth Release form when submitting the Independent Youth registration. Full and partial scholarships are available to cover the cost of the conference registration. It does not cover hotel or food costs. Applications must be submitted by March 15. No scholarships will be given after March 15. A $50 refundable fee will be charged when registering. If you are willing to help support the scholarship program, please go to the Scholarship Donation in the sidebar and select the amount you would like to contribute! Thank you for your generosity! Scholarships are supported by donations and by the Raffle & Silent Auction. How does the Raffle & Silent Auction work and how can I donate an item? The Raffle & Silent Auction are a fun way that we raise funds for Scholarships. At the conference, raffle items will be displayed, each with a bag for tickets. You can buy tickets and place them in as many bags as you like. At the end of the conference we’ll draw names from each bag and you may take any items you’ve won with you. We’d love to get a wide variety of items donated. Popular items include toys, games, books, knitted or crafted items, baskets, goodies, music – really, anything unschoolers will enjoy. Our Silent Auction Basket theme is LIFE is Good! – Things that make life good! If your family would like to donate a basket, just put together some things that you think make life good. You can use any kind of container – it doesn’t have to be a “basket”. Use your imagination and have a great time with this! To donate an item or basket, contact us or just bring it along to the conference with you. We’ll take it from there. What is the Instant Gratification table? This is a chance for the younger members of our community to participate in the raffle without any waiting or disappointment. They get to exchange one ticket for any item on the table. The table has small toys, temporary tattoos, bubbles, stickers and other similar items. We need donations for the table, so start collecting! Can I get recordings of the Speaker Presentations from past conferences? Yes! Recordings from the 2007, 2008, 2009, 2010, 2011, 2012 and 2013 conferences are now available in mp3 format. All are available for purchase in our Conference Store. What’s the weather like in Portland, OR? The fee covers all presentations, funshops, conference bags and scheduled events from Thursday through Sunday at 5:00 p.m. It does not cover t-shirts, hotel or food. Is this thing good for kids? It’s really, really cool for kids. Children of all ages are welcome everywhere at the conference, including the Main Presentations. We don’t provide child-care, but we do have toys set up to help parents entertain their littlest unschoolers. And if you do want someone to help with your kids, there are usually teens available who would love to make a couple of dollars to babysit during a session. Most of our funshops are geared towards children, plus there will be music,singing and dancing, a video/computer game room for our gamers, and a room with video and board games. LIFE is Good is first and foremost a family event. At past conferences, attendees often began arriving at the hotel up to one or two days before the actual conference. You’re free to do this. Otherwise, registration will begin on Thursday at noon. The first activities will begin at 3:00 p.m.
Is there a Facebook Group for this conference? But of course! Click here to join. You can be a LIFE is Good volunteer! Just go here and fill out our volunteer form. We can use help before, during and after the conference. Just let us know you’re ready, willing and able to help out! We’ll find a way to put your talents to good use. Remember, getting involved and volunteering is one of the best ways to ensure you’ll feel like a part of the community. Can I register for just one day? You can come for just one day, but, alas, you must pay the full fee. We’d like to camp or stay in our RV. Are there accommodations nearby? Yes, here are a few options. SE on 99W can accommodate pop-up trailers and RVs…no tents. Will there be conference t-shirts? Of course! The t-shirts are 100% cotton, with details about color and design available in our conference store. We’ve also got a racer-back tank top available this year. Check them out! Conference T-shirts MUST be pre-ordered by April 15. 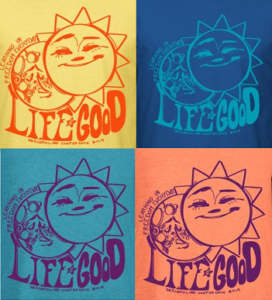 Are you associated with the Life is good® t-shirt company?